Woolworths is giving first time Woolies online shoppers the chance to meet the supremely talented Keith Urban. Hell, yeah! Keith Urban comes to Australia with his national Light The Fuse Tour Australia this June and to celebrate, Woolworths is giving first time online shoppers the chance to WIN tickets to see Keith perform live - and also meet him in person backstage. No, this is not a dream, 'Urbanites'! (Is that a 'thing'? If not, I'll take credit for that clever tag). To be in with a chance of winning, shoppers simply need to register for their first online shop at www.woolworthsonline.com.au between Sunday June 1 and and Tuesday 10 June, 2014. This fab opportunity not only rewards new online shoppers, it also supports research* showing that busy people could save nearly 20 hours* a year doing their grocery shopping online, giving them more time back for themselves. Who doesn't want more of that!? Woolworths Managing Director of Supermarkets and Petrol, Tjeerd Jegen said, “We’re tremendously excited to be the presenting sponsor of Keith Urban’s 2014 Light the Fuse Tour Australia and be able to reward our shoppers with the opportunity to experience him live in concert and go backstage to meet him. “Our online shopping service is just one of the many convenient services from Woolworths designed to save our customers time. More than 400,000 Aussies now embrace the convenience and flexibility of shopping online, and this number is growing by 50 per cent year on year,” he said. Woolworths’ online shopping network covers 96 per cent of the Australian population with new stores added to the network on a regular basis. Items ordered online are selected by specially trained personal shoppers ensuring a personalised service for each and every customer. 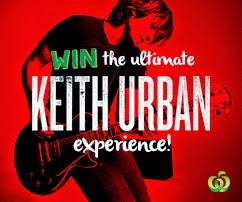 For your chance to win tickets to see Keith Urban live in concert register for your first online shop 24 hours a day, seven days a week and take advantage of free weekend delivery by visiting www.woolworthsonline.com.au. As a bonus for entering this competition via Josie's Juice blog, Woolworths has been kind enough to offer up FOUR lucky readers who enter a bonus WISH gift card valued at $50. (Competition available to Australian residents only).